The good people at Gawker asked me to write something for them. And by people, I mean, "AJ Daulerio," whose last communication with me before that was probably reading me saying incredibly rude things about him. I'm sure this is a lesson for young students out there, and I'm sure it's the wrong one. 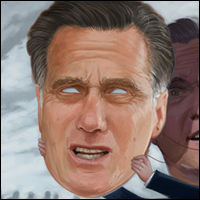 Anyhow, I was lucky enough to be able to write something that had been bugging me about Mitt Romney — namely, that the man is so thoroughly artificial that what stands out about him on the campaign trail is not that he's unreal but that he's badly faking being fake. Gawker illustrator Jim Cooke was also gracious enough to create this original work for the piece. Also, if you get the chance, you might also really enjoy this excellent take on Mitt and his dad from Rick Perlstein.